This is also my favourite receipe. This kootu has different namakaranam "vellamum Thengayum arachu vitta kootu", "kadukum thengayum arachu kottina kootu", "chenayum elavanum(winter melon) pottu kootu"(sounds funny but tastes yummy). This also a simple receipe. The main ingredients are as follow. curry leaves - 5 nos. Take a wide pan and cook channa dal till 1/2 cooked (can also be pressure cooked) make sure its not fully cooked. Now add suran and winter melon to it. Add a little water, turmeric powder and salt to it and let it cook for another 5 to 7 mts. The veggies should be tender and the dal should be 3/4th cooked. Now take a small pan preheat 1 tsp of oil, add mustard seeds when it splutters add red chillies and 3 tbsp of coconut to it and fry it till golden brown. Do not burn the coconut or chillies. Let it it cool and grind it into a fine paste. When the veggies and dal are 3/4th cooked add this paste and jaggery to it and let it cook for another 5 to 7 mts till the paste get mixed with the veggies and dal. The consistency should be thick not watery. Take a small seasoning pan, pre heat the remaining oil add mustard seeds, urid dal, red chillies, asafoetida powder and curry leaves to it and stir it for a minute and pour it on top of the kootu. At last, sprinkle the remaining 1 tbsp coconut on top of the kootu. Now the kootu is ready to serve. 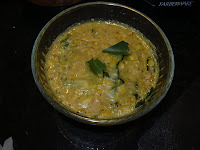 This can be a good side dish for sambar rice, more kozhambu, Mango kootan.